This page is about the French medium tank M4A1 (France). For the American version, see M4A1. For other uses, see M4 (Disambiguation). 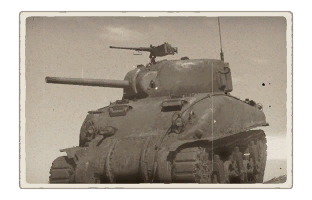 The ▄M4A1 Sherman is a Rank II French medium tank with a battle rating of 3.3 (AB/RB/SB). 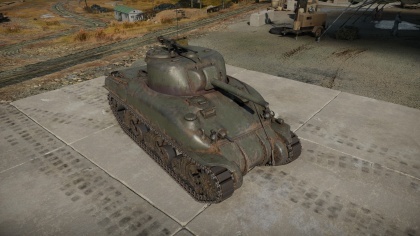 It was introduced in Update 1.75 "La Résistance". At a battle rating of 3.3, the M4A1 Sherman is a very capable medium tank. The 75 mm M3 cannon is capable of destroying nearly all armoured targets at the battle rating. Combined with the very fast turret traverse rate, fast reload time of 6.5 seconds and a vertical gun stabilizer, this tank is suited to an aggressive play style due to your ability to react quickly and fire relatively accurately without coming to a full stop. The gun depression of -12° also makes this tank excel in hull down positions unlike any other tank. One must take into account this tanks very thin side armour of 38.1 mm thick, anti tank weaponry of any rank will be capable of penetrating this weak side armour so protect your flank. Beware of this tank's very poor reverse speed as it only has one reverse gear. This affects the tank's ability to play in a defensive role. 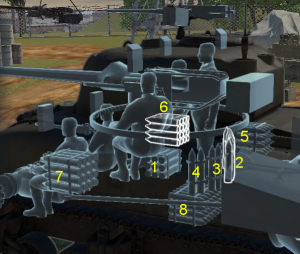 In addition, this tank is very prone to engine fire, so the FPE is a modification that must be completed ASAP. Also be sure not to let the enemy get sight of your driver and radio operators hull view ports. One single halfway decent shot, even from 20 to 30 mm guns can end you. The tall profile of the tank is an advantage and disadvantage. In the context of a hull down position, it is an advantage due to you being able to angle the turret down over a hill or crest without having to pull further up the hill. The tall profile however does make you more visible and the tall hull makes it easy to set off an ammo rack. 50.8 mm weak point on turret's right side. After the Fall of France, the Free French force served with the Allies. They soon relied on new modernising equipment from the United States Lend-Lease. From the period of 1943 to the end of the war, the United States supplied a total of 657 M4 Sherman tanks to the Free French, of which 383 were the M4A2 and 274 were the M4A4 Sherman tanks. These tanks, along with M3A3 and M5A1 Stuart light tanks helped formed the Free French armoured divisions (Division Blindée (DB)), which themselves were modeled after the American armoured divisions. The Free French armoured divisions would be committed to the Battle of Normandy in 1944, with the 2nd DB composted entirely of M4A2 while the 1st and 5th DB came with a mixed assortment of M4A2 and M4A4. Replacing lost or worn-down equipment in the Free French armoured divisions led to the issuement of vehicles from the US Army inventory, leading to the presence of the M4, M4A1, and M4A3 Sherman models in the divisions. They have also been seen using M4 Sherman models with different armaments, such as the 76 mm Gun M1 and the 105 mm howitzer. ↑ Zaloga Steven. Armored Thunderbolt: The U.S. Army Sherman in World War II Stackpole Books, 2008, "Appendix C"
This page was last edited on 29 March 2019, at 06:56.